A call or put option is considered to be at the money when its strike price is equal to the price of the underlying asset. Regardless if the option is a call or a put, at-the-money options function exactly the same way. The key thing to note about at-the-money options is that they always have a strike price that is equal to the price of the underlying asset, this classification of options never has any intrinsic value. Options for US stocks always need to settle at least $0.01 in the money to have value at expiration; and that value would be $0.01. Note: At the money will sometimes also appear as “at-the-money” and “ATM.” Both variances of the term mean the same thing. However, “at-the-money” is most commonly used to describe an option, i.e. the at-the-money put. Whereas, “at the money” is most commonly used to describe where an option is located, i.e. it is located at the money. Colgate-Palmolive Company, which trades under the ticker CL, is trading at $73 per share. Both the $73 put and a $73 call are considered to be at the money, since the “money” is $73. 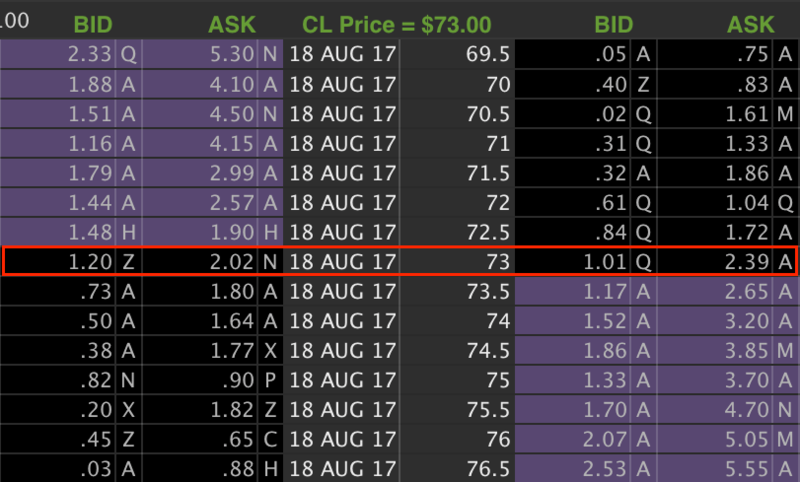 Even if CL trades to $73.02, the $73 call and the $73 put will technically not be considered to be at the money, even though they are very close. This CL option chain shows the ATM $73 put and call. The calls are on the left, and the puts are on the right. The strike price for both options is highlighted by the red box. The main situation where at-the-money options are important is for the straddle option strategy. Straddles always involve both the same strike price put and call, and it is common to trade them at the money. Note, however, that is is not necessary to trade straddles at the money, even though this is the most common form. Although it is technically incorrect, many traders refer to the options that are near the money to be at the money. Unless the strike price and the underlying price match, the option is not at the money. Options that are at the money are not used too much, because it is somewhat of a rare occurrence, as the strike price and the underlying price must match perfectly.